These anti-siphon valves have been manufactured under various names with Irri Trol being the last name plate. They come in 3/4" and 1". Manual Richdel 3/4" & 1" (R706 & R709) converted to electric with the R 756 actuator. The R756 and associated parts are not available. It is easier to replace the actuator, made by Orbit #57030, than repair it. Don't confuse this type of electric valve with the R711 & R713 valve that were manufactured as electric valve. R711 3/4" and R713 1" model are no longer manufactured. This series has a set of stainless steel bands between the screws and the bonnet. As with the R756 above, the most frequent failures are the breaking of the metering screw (valve won't open) or a tear in the diaphragm (valve won't close). The diaphragm assembly (100232-H) will fix either problem and the same diaphragm works in either the 3/4" or 1" valve. The anti-siphon kit is specific to each size and are not inter-changeable 3/4"- R217104, 1" R519108. 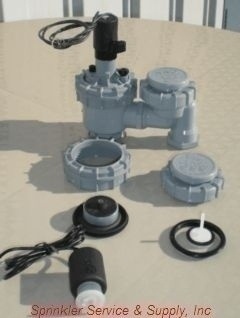 However, the anti-siphon kit (cap, float & seal) will work with respective manual valves. 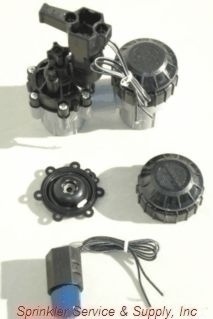 Also available for the R711 and R713 is a bonnet kit (shown right) that includes bonnet, diaphragm, spring and screws, solenoid is extra. The bonnet kit,#R205TFKIT, will fit on either the 3/4" or 1" valve. The most recent iteration of the popular anti-siphon valve from IrriTrol is the jar top version (2711DPR 3/4" & 2713DPR 1") shown left. The diaphragm, 100236, will work in either size as will the nut cap, 549101. The 2700APR uses 8 screws to attached the bonnet to the body. It has a separate diaphragm from the DPR series. Diaphragm model 539001 will work in either the 3/4" or 1" version. 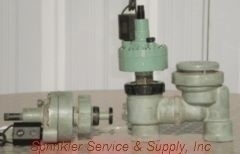 The 2700 series valves use the same anti-siphon cap kit as the previous valves. Solenoids: all IrriTrol valves, past and present, take the same solenoid, the threads and depth remain the same. However, the new solenoids have a captured O-ring already included. This means that on older valves (R711, R713, R756 series) you will need to remove the existing O-ring in the bonnet or the valve will not shut off. Additionally, the new series of valves (2700APR, DPR and R2623 actuators) have the the solenoid threading into a manual operation bushing before threading into the bonnet. This bushing, sometimes, will also have to be replaced if it is cracked or stripped. 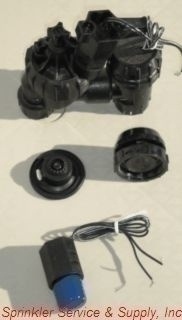 ***Discontinued***Rain Bird APAS 3/4" & 1" valves. 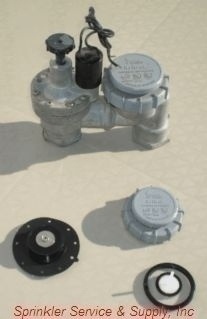 The APAS valve was generally sold in hardware stores and DIY home centers. We were notified that as of May 2008 the valves and repair kits were no longer available from Rain Bird. We have recently found an actuator that will fit in the APAS body so you do not have to cut out the valve to repair it. The 1" 600100CH00 ($27.41) Actuator will thread into the old Rain Bird APAS body making the obsolete APAS functional. On the left is the Rain Bird jar top anti-siphon valve JTVFAVB made in either 3/4" or 1". 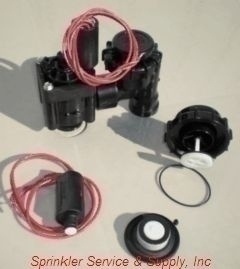 The diaphragm #231771, anti-siphon cap kit #210067 and solenoid #208588-01 will work in either size valve. Shown on the right is the ASVF valve in either 3/4" or 1". 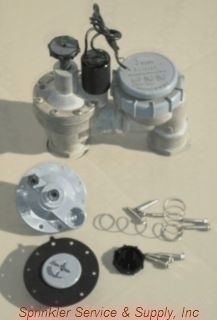 The diaphragm #210746-03, anti-siphon cap kit #151933 and solenoid #208588-01 will work in either size valve. 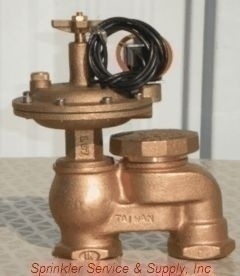 Hunter's anti-siphon valve series is the PASV and is made in either 3/4" or 1". The diaphragm assembly #332100, anti-siphon cap kit #590306 and solenoid #434100 will work on either size valve. We stock parts for brass actuators (Superior) that go into brass valves. They are not too difficult to repair and it is cheaper than buying a new $40 brass actuator. On the right is the IrriTrol R2623 actuator in either the 3/4" or 1" version. We have parts for the newer version of this actuator. The older style has a bonnet that looks like the the R711 series with the steel bands on top. The bonnet of the R2623 looks like the 2700APR version. 1. A broken wire in the solenoid coil results in an 'open' condition and the valve will not come on. Same result if a station wire is broken. 2. A shorted wire in the solenoid coil, 'short', will draw too much electricity and cause the controller to either melt a fuse or trip a circuit breaker. The valve may operate partially for a small period of time before the circuit breaker trips. Same symtoms if the station wires are wired wrong, an immediate tripped circuit breaker will occur. 1. For most IrriTrol valves, a tear or leak in the diaphragm will result in the valve not closing. 2. 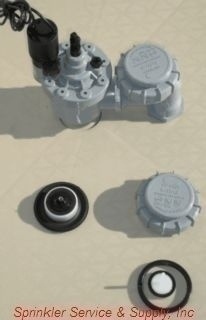 For most Rain Bird valves, a tear or leak in the diaphragm will result in the valve opening only partly or not at all. When water leaks out of the anti-siphon cap when the valve is 'on' either the gasket or O-ring is damaged or there is something (rock or bug) preventing the float from sealing against the bottom of the cap. Open the cap and clean debris or replace float/cap assembly. When water pipes in the house knock or bang when the valve comes on or shuts off the primary problem is to much water flowing too fast through the valve. Sometimes you can put a check valve or water hammer arrestor (compressed air tube) right before the valve and that will help. 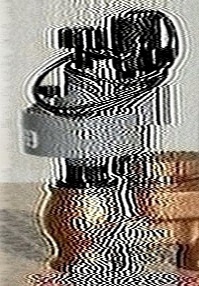 But the only real solution is too reduce the amount and speed of the water traveling through the pipes and valve. If you turn off some sprinklers and the water hammer abates on that valve you need to either change the sprinklers to lower flow rates or add another valve. If you have a sprinkler that is always dribbling water hours after the valve has shut off, you have a valve problem, not a sprinkler problem. Usually the 'leaky' sprinkler is the lowest head on the system and all the water leaking through the valve drains out at the lowest point. The valve has either a bad seat disc or diaphragm. Both are easy to fix unless you have a valve for which parts are no longer available. 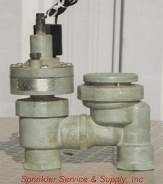 Watermaster anti-siphon valves made by Orbit have had a variety of diaphragm-seat disc configurations over the years. Some of the older valve diaphragms are no longer available. On some of the newer valves that have a beaded diaphragm-seat disc assembly we have been successfull in converting a certain type of Irri Trol 2700 DPR diaphragm assembly to work in the Watermaster valve. We are still searching find a 'work around' solution for the older diaphragm series so you don't have to cut out the valve.